This video is from the February 9th 2010. Staphan O Bell recording the Vako Orchestron Vocal Choir Disc. 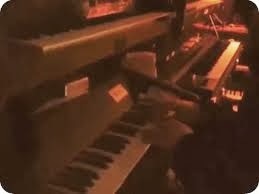 The Vako Orchestron is like the optical weird cousin of the Mellotron. It wasnt a big hit amongst musicians and only about 50 were built. Instead of having the sounds on tape the sounds are stored on optical discs. Some of the artists that have used the Orchestron are Kraftwerk, Rainbow, Yes and Jethro Tull. Staphan O Bell is just about to release his debut album.